Sri City, July 2, 2016:- Ms. Seetoh Chun Kum, Vice President (Planning), Surbana Jurong Pvt., Ltd., Singapore visited Sri City on Friday evening. Mr. Ramesh Subramaniam, President, Sri City Foundation received her and extended a warm welcome. Ms. Seetoh Chun Kum went round the campus, which was master planned by her. 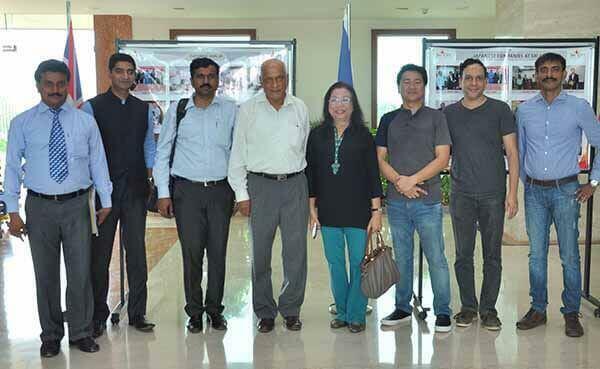 Ms. Seetoh Chun Kum who is executing the task of preparation and implementation of integrated master plan for the Vizag-Chennai Industrial Corridor project for Asian Development Bank, was touring the coastal areas of the state. As she was closely associated with the planning of Sri City, she was very curious to see how it got translated into reality. Thus she visited Sri City. Following the visit, she met Mr. Ravindra Sannareddy, Founder Managing Director, Sri City and conveyed her appreciation for the rapid progress achieved. Commending the efforts of the Managing Director for developing it to the present level in a short stint of time, Ms. Seetoh Chun Kum said that usually it takes minimum 10 to 15 years to develop industrial parks of this scale and standard. She said that she feels proud to have been associated with Sri City during the planning stage. Ms. Seetoh Kum Chun has more than 30 years of experience in planning industrial parks and facilities in various countries. Currently she is associated with the task of designing Andhra Pradesh capital city Amaravati. Surbana Jurong, one of Asia’s consultancy powerhouses for urban and infrastructure developments, provides one-stop complete value chain consultancy services in more than 200 cities in over 50 countries worldwide.